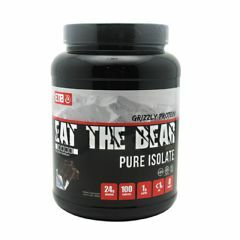 AllegroMedical.com presents The Eat The Bear Grizzly Pure Isolate - Chocolate Protein Supplement. ETB Grizzly Pure Whey Protein Isolate is protein in its purest form. This incredible quality is what separates it from the competition. Not only is ETB's whey pure isolate protein fat-free, it also has less calories than other national leading brands. Like many of our powders, ETB Whey Pure Isolate Protein comes in every one of our wide of flavors. It is packed with 25g of pure isolate protein per serving and designed for anyone who enjoys healthy living, and feeding their body the nutrition it needs. Give your body what it needs to perform at its best when you purchase a great tasting, high quality, affordable protein from Eat The Bear! Add one level scoop of Whey Pure Isolate Protein to 8oz. of cold water, non-fat milk, juice or your favorite beverage. Adjust the amount of liquid to meet your desired taste and consistency. Shake, stir or blend until dissolved. We like to make our chocolate whey protein shake with cold water and crushed ice during the summer. Enjoy! Before consuming ETB Pure Whey Protein Isolate seek advice from a physician if you are unaware of your current health condition, have any pre-existing medical condition, taking any medication, planning any medical procedure, pregnant, nursing, or contemplating pregnancy. Not recommended for individuals with allergies to dairy products. Reduce or discontinue use if any adverse reactions occur such as but not limited to gastrointestinal discomfort. ETB Pure Whey Protein Isolate is only intended to be consumed by health adults 18 years of age and older. Excessive protein intake may result in impaired kidney function. User assumes all risks, liabilities, and consequences in regards to testing under sports organizations where certain ingredients may be prohibited. Do not use this product if the safety seal is broken or missing. Do not exceed the recommended serving. Exceeding the recommended dose will not improve results. Allergen Warning: Manufactured on equipment, which processes product containing milk, egg, soybeans, wheat, fish oil, tree nuts, and peanut flavor. KEEP OUT OF REACH OF CHILDREN AND PETS.